Apex Legends' Bunker got a big nerf for everybody who loves camping and Respawn Entertainment didn't even tell anybody about it. 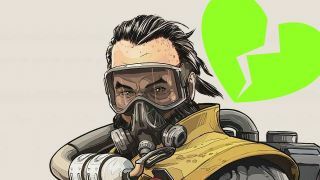 The vents that used to make for handy, concealed perches in Bunker's many interior rooms appear to have been quietly removed in the Apex Legends season 1 update; Caustic mains are still mourning the loss and request privacy in this difficult time. The boxy lads used to be found over the door on the inside of every room in the Bunker. They were wide and deep enough for two players to climb up and stand side-by-side, hidden from enemies who might peer in from the windows outside. By the time you could spot anybody up there they were directly above you, setting up easy headshots. Caustic could even load a room up with gas bombs then gaze down in delight at the bright outlines of his choking, bleary-eyed victims. Here's what the Bunker's interior doors used to look like. And here's what they look like now. Bunker's claustrophobic corners and corridors continue to make it an ideal hunting ground for the Toxic Trapper, but I'm sure Caustic mains will never forget the glory days. Hopefully Respawn Entertainment has some Caustic buffs on the way to make up for this loss. They could at least put air conditioners above every door for April Fools' Day.